Whenever I hear an Ella recording it grabs me at my core. I’m entranced by her. [She] is sublime…I’m so excited to celebrate an artist who has meant so much to all the notes in my musical life. Virtuoso violinist, Regina Carter, reveals the many faces of Ella Fitzgerald, which have influenced Carter’s own remarkable path. Simply Ella marks the 100th birthday of a musical legend—the incomparable Ella Fitzgerald. 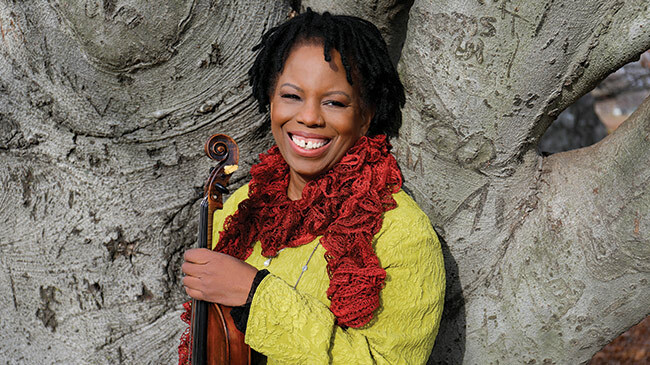 This Detroit native is the foremost jazz violinist of her generation. For Regina Carter, the violin is not simply an improvisational vehicle; it is a passport to unexpected realms. A Grammy nominated artist, her quest for beauty and her passion for excellence did not escape the attention of the MacArthur Foundation, who awarded Regina their prestigious fellowship “genius” grant. Recently Carter was selected as the 2017 Showcase Artist for the Monterey Jazz Festival and in 2018 was appointed Director of the New Jersey Performing Arts Center All-Female Jazz Residency.